Nearest: Tube Station: Holborn 211 yards (192 metres), Railway Station: Farringdon 0.6 miles (1 km), DLR Station: Tower Gateway 2 miles (3.3 km), Motorway: M1 Junction 1 6 miles (9.7 km). There are 4 tube (underground) stations within half a mile (0.8 km). The Citadines Covent Garden Holborn Apartments is ideally located close to some of the best known tourist areas and attractions in London. Actually on High Holborn which can be thought of as the very Eastern edge of central London. High Holborn is a busy major road during weekdays but relatively quiet during weekends in line with the City of London. As you move east from this point you are into the business areas such as the City of London and the Docklands beyond that. However a short stroll to the West (a few minutes) finds Covent Garden where the London west end and theatreland begins. here you will find places such as the Royal Opera house and the Covent Garden Piazza (0.4 miles). Just beyond this is Soho which is well known for its restaurants, clubs and for its adult oriented section. Russell square which is a very popular area for budget accommodation is just to the north of the hotel as is the British Museum (0.3 miles), a very popular attraction. Nearest attraction to the hotel is the Sir John Soames Museum at 140 yards. A refreshing, modern and comfortable block of studio apartments and a good base for experiencing London and the many sights it has to offer. Apartments are air-conditioned. Amenities include kitchen (includes cooking facilities, fridge, dishwasher and utensils), bathroom, high speed internet access, hairdryer, satellite television, direct dial telephone with private telephone number, and in most apartments an individual safety box and Hi-fi. Towels and bedding are supplied. Features 152 studios for one or two guests and 40 one-bedroom apartments for up to four guests. Each studio has a pull-out bed while the flats have sofa or pull out bed in the lounge and one double or two single beds in the bedroom. One apartment and six of the studios are adapted for accessibility. The building has a breakfast room/lounge where breakfast is served 07.00 till 10.00 (charge). The Citadines Aparthotel offer the convenience of many hotel amenities including air-conditioning, vending machines, Launderette, dry cleaning, wakeup call and 24-hour front desk. The reception can supply safety deposit boxes. Within the aparthotel lobby WiFi internet access is available. Business travellers are catered for with an onsite business corner and meetings rooms facilities. Babysitting services can be requested (charges apply). Please note: The hotel offers maid service only once a week. You can request further housekeeping but this is charged for. Free broadband internet access tin all rooms. Public parking is available on site and costs £30 per day. Citadines Trafalgar Square: is 0.8 miles (1.3 km) away, has a guest satisfaction score of 82% and rates start from about £143. Citadines Barbican Apartments: is 0.9 miles (1.5 km) from here, earns a customer rating of 86% and base rates begin at about £107. Citadines St Marks Islington: 1.2 miles (1.9 km), rated at 80% and with rates from around £120. Citadines South Kensington: 3.1 miles (5.0 km), rated at 83% and with rates from around £111. Compared to other London hotels: This hotel has been rated 82% by past guests. The London average is 80% and the average for 3 star hotels is 76%. Therefore this hotel is above average for its sector (star rating) and for London as a whole. Citadines Hotels across the chain average 84% so this hotel is slightly below the guest rating for most Citadines hotels. Below average for a Citadines hotel but still a hotel to consider. The hotel remains better rated than most London hotels and additionally ranks above the average guest rating for 3 star hotels. Milesfaster ranking: 347th from 866 London hotels, 3rd of 5 Citadines Hotels, and 90th of 329 three star rated hotels. Another to Consider: A similar hotel nearby (0.2 miles, 0.3 km) would be the 3 star Motel One Tower Hill, where rates start from £99 and which has a 90% guest satisfaction rating. If your mainly looking at apartments maybe have a look at the Comfort Inn Kings Cross/St Pancras. It is 2.3 miles (3.7 km) away with rates from £149 having scored a guest rating of 78%. Looking for lower base rates? Then another option might be the Travelodge Central Tower Bridge. 0.2 miles away (0.3 km), achieving a rating of 80% by its past clients where rates start from approximately £51. Prefer something with a higher guest rating? Then the 4 Star Amba Charing Cross may be one too look at being 2.0 miles (3.3 km) from the Citadines Holborn Covent Garden. The Amba Charing Cross has an extremely high guest rating of 98%, one of the best rated London hotels. The fifty hotels that are closest to this location (94-99 High Holborn, WC1 postcode) which we list extend for a 0.6 miles (1.0 km) radius. They are made up of 9 five star hotels (average rating 90%), 23 four star hotels (average rating 84%), 14 three star hotels (average rating 78%), 2 two star hotels (average rating 73%) and 2 one star hotels (average rating 62%). Top 3 star hotel is Premier Inn Holborn at 90%. Top rated of the local hotels are Montague On The Gardens Hotel (4 star) and also the Covent Garden Hotel (5 star) (both joint top with 99%). Base Rates: Base rates can indicate the lowest available rates for a particular hotel. This is a good general guide but as base rates do not account for special offers and one off deals they can only be a rough guide. The average base rate for all the areas hotels is £132 per night. From a low of £16 at Generator Hotel (2 Star, 77%) and the highest rates top out at £396 at Savoy Hotel London (5 Star, 91%). The following are the averages for each star level: Five Star average: £254, Four Star average: £136, Three Star average: £72, Two Star average: £37 and One Star average: £53. 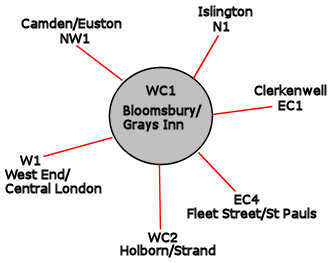 Using our in-house algorithm we rank hotels based on guest ratings and weighted for related factors we rank Citadines Holborn Covent Garden 20th (joint) of 50 area hotels and 3rd (joint) for the 14 three star hotels in the area. We rank the hotel 25th of 50 (14th of 14 three star hotels.) for base rates. We rank this hotel based on rates and also review scores to place it 47th of 48 of all the closest hotels in terms of value for money (Generator Hotel was top).